In 1860 Manuelito and Barboncito began their war against the Americans. In January of that year they attacked the Ft. Defiance hay camp. In February warriors descended on a group of soldiers guarding livestock. By April they believed they could take the entire fort. The warriors attacked on April 29th, but the fort commander had been warned and opened fire with canons. After several hours of fighting the Navajo fled to the mountains. The troops remained at Ft. Defiance and did not leave until the outbreak of the Civil War. In 1861 Federal troops left Indian country to go to Texas to battle the Confederate troops. While the soldiers were gone Navajo and Apache warriors stepped up their raids throughout the territory. At the battle of Glorieta Pass near Santa Fe the Confederate forces were defeated and the U.S. Army was now free to concentrate on eliminating the warriors raids. General James Carleton, the commander of American troops in New Mexico, wished to stop the fighting between the tribes and the New Mexican settlers. 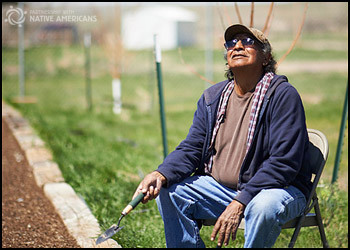 He wanted to move the Navajo to a reservation away from their traditional lands. Carleton met with Navajo chiefs Barboncito and Delgadito, ordering them to move their people to the Mescalero Apache Reservation at Bosque Redondo in eastern New Mexico. The Navajo chiefs refused. Carleton ordered Col. Christopher (Kit) Carson to deal with the Navajo as he had previously done with the Apaches, forcing them into submission. Carson established a base camp at Ft. Defiance in June of 1863 and commenced his scorched earth policy against the Navajo. Scouts from Ute, Zuni and Hopi tribes, traditional enemies of the Navajo reinforced Carson's command. The objective was to destroy Navajo crops and villages and capture livestock. Carson and his troops inflicted considerable damage to Navajo homes and crops throughout the summer and fall of 1863. During the fall of 1863 and the winter of 1863-64, he continued to push into the remote areas of Canyon de Chelly killing livestock and destroying, even more, crops. Starving, many Navajo surrendered to Carson. Eventually, even Barboncito and his band surrendered. From Ft. Wingate the Navajo would make the infamous "Long Walk" to Bosque Redondo. It was not until 1868 that the Navajo negotiated a treaty to return to their ancestral homelands.